I've been posting stories here about Vince Testa, who believes he was wrongly convicted in Lake County of resisting arrest; and his efforts to see the misdemeanor conviction reversed. 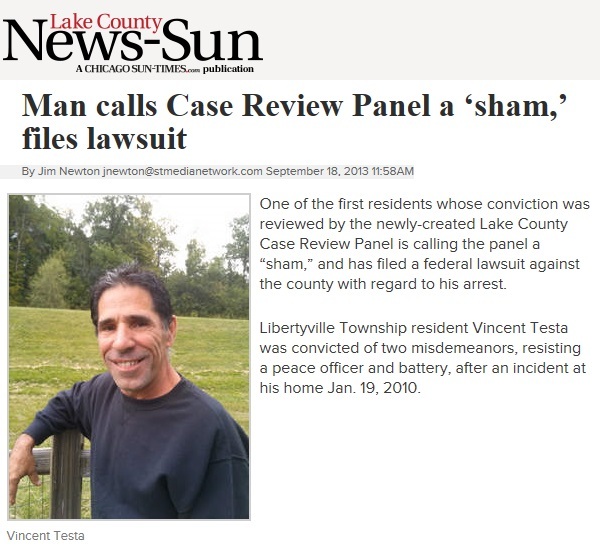 A Sun-Times newspaper, the Lake County News-Sun, has just published a story about Testa called, Man calls Case Review Panel a 'sham,' files lawsuit. Testa had submitted his case to Lake County State's Attorney Michael Nerheim, who was elected on the promise that he would create an independent Case Review Panel to investigate past convictions. Nerheim accepted Testa's case but declined to overturn his conviction, without explanation. In one story posted here called iFramed: Epilogue, I noted that the existence of a Case Review Panel in the State's Attorney's office actually raises more questions than it answers. The recent News-Sun story about Testa does answer some of the questions I raised. the eight-member panel does not hold public sessions or hearings on the cases. Rather he meets with the panel in roundtable discussions once evidence in the cases is reviewed. the panel was not intended to take the place of the appeals process, and that its review of cases is a "bonus" for those seeking to have their convictions reversed. The News-Sun story did not elaborate on what Michael Nerheim meant by the word BONUS.